Asia's biggest-ever fireworks festival starts on April 29 and ends on June 24. 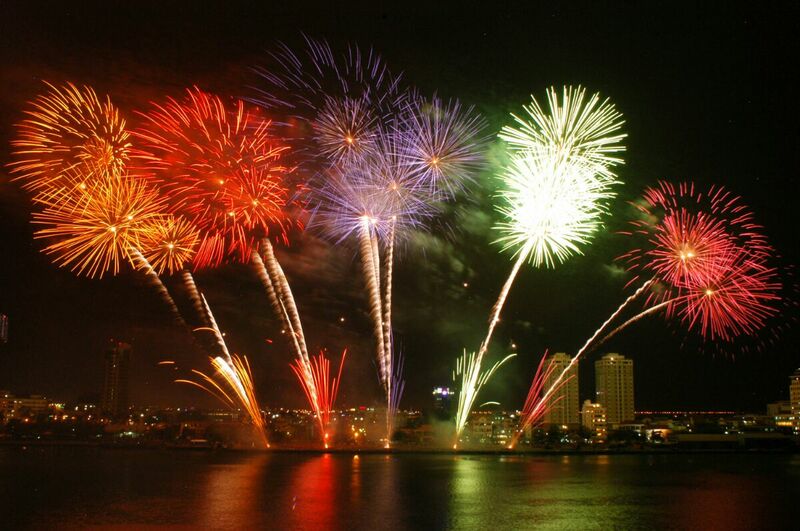 For the first time, the Danang Fireworks Festival, also known as the Danang International Fireworks Competition (DIFC), will be held for two months, every Saturday night, starting April 29 to June 24, instead of only two nights as was the case in past events. The Danang Tourist Association said that the change was made in order to welcome more tourists to the event and to promote tourism in the city. The competition will take place at Asia Park on the Han River, an amusement park built by the Sun Group. Eight teams from the US, France, China, Austin, Australia, the UK, Switzerland, and Vietnam will pit their talents and flair for fireworks in line with this year's theme of the Sparkling Marble Mountains or Ngu Hanh Son, a cluster of five marble and limestone hills located in the Ngu Hanh Son District, south of Danang City. The five mountains were named after the five elements: Kim (metal), Thuy (water), Moc (wood), Hoa (fire) and Tho (earth). During the festival, many other exciting activities will be taking place, such as a fire ceremony, an international culinary and beer festival, Cham cultural discovery, stone sculpture displays and musical performances. DIFC is a biannual international fireworks competition that began in 2008. It usually takes place at the end of April with the participation of international competitors in its host city of Danang. At each event, fireworks display teams perform a different theme for two nights. Visiting Danang during this event, visitors are guaranteed a colorful and breathtaking experience on the Han River. The scenery is even more beautiful and majestic at night. This is also a good chance for tourists to discover Danang City, which is conveniently located next to three UNESCO’s heritage sites: Hoi An Ancient Town, the Hue Citadel and My Son Sanctuary. The Danang Fireworks Festival is expected to welcome two million visitors in 2017. In 2015, there were 460,000 guests, up 13.9 per cent against 2013. Last year, the city welcomed more than 4.6 million visitors, climbing 20 per cent against the previous year.